Godzilla and Barugon had a baby – and made Gamera jealous! 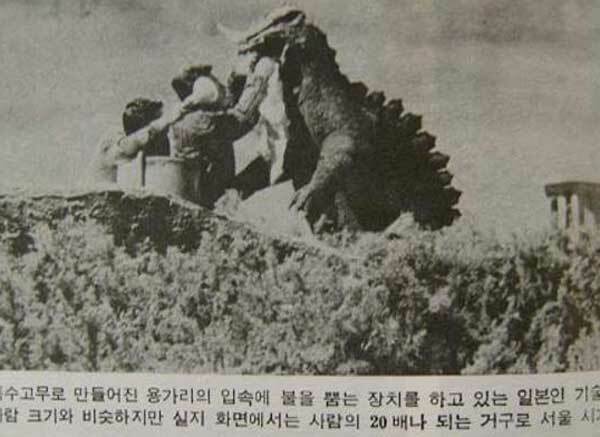 Godzilla – South Korea edition. After an unnecessary prelude with a married couple, a rocket orbit for no reason (the filmmakers displaying their complete ineptitude on space program dialect), and an earthquake caused by a dropped nuke, all of which have no connection to one another, but somehow share the same movie-space – out pops YONGARY! Looks like someone was paying attention to what made Godzilla movies tick: giant reptilian monster created by radiation, toy city destroyed, crowds fleeing, toy tanks, toy planes; even the spikes on Yongary’s back resemble the Christmas tree-like ornaments on Japan’s favorite wrecking ball. On the periphery, there’s the Scientist, the Soldier, the Politician – and the Annoying Kid who Saves the Day, who tells the army what to shoot, tells politicians how to politic, and tells scientists how to science. When the earthquake seems to consciously head towards Seoul, one of the military guys says, “Science won’t help us now.” What do you even mean by that, Shinto freak? Do you know what “science” is? It’s a methodology, not a religion, or a set of instructions, you imbecile! One of them ponders, “When I was young, my grandparents used to tell me about a monster that caused earthquakes – Yongary.” Oh, so that’s the explanation. Yes, better than science. In this South Korean promo, Yongary is treated for his anger issues and Godzilla complex. Long before the internet, everyone in the movie suddenly knows to call that one-horned rubber suit “Yongary.” It walks on its hind feet, has a long tail and back spikes, blows fire and roars. Uh, sure it’s not that Japanese rubber, Godzilla? The Annoying Kid named Ichio, who has a propensity for stealing his scientist friend’s inventions and using them to prank people, pilfers an “itching ray” and uses it on Yongary. Due to Yongary’s disco movements, Kid argues that Yongary must be good and pure and is only hungry for oil. Who exactly is this message for, Kid? 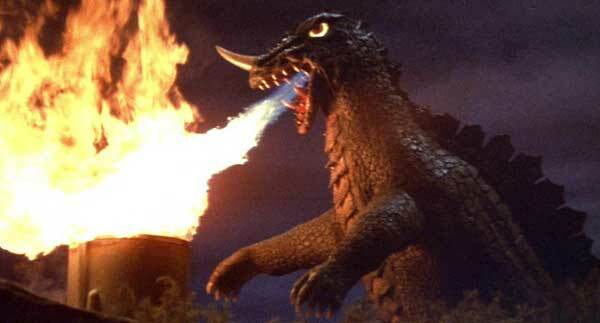 Too little emotion too late, to try for the weepy finale of the original GODZILLA. Whereas GODZILLA was a parable about man’s hubris, YONGARY is about fending off plagiarism lawsuits from Toho Company. Unlike this movie, which really meant to hurt us. Writers: Ki-duk Kim, Yun-sung Seo. Starring: Yeong-il Oh, Jeong-im Nam, Sun-jae Lee, Moon Kang, Kwang Ho Lee.